At 7.75 (+/-) acres and rising 44 (+/-) ft above sea level, 'Great Rock Island' is considered a "land-tied" island -a rare geological feature in that it has become connected on its far eastern edge to the mainland by a barrier beach road- while the rest of the formation is completely surrounded by serene salt marshes that are fed by two high tides daily. Adjacent and to the immediate west of Great Rock, lies 'Little Rock Island'. At 3.82(+/-) acres and rising 32(+/-) ft above sea level, Little Rock is completely surrounded by salt marsh and offers incomparable sunset views over Cohasset Harbor and skyline. With more than thirty changes in course, the islands steep terrain ranges from the tidal pools along the water's edge to dramatic outcroppings of bedrock, rock faces and scenic ledges - most characteristic of the choicest south shore coastline. While no structures currently exist on either island, "regulatory approvals" are in place for an 8-bedroom family dwelling on Great Rock with allowable accessory uses. Great Rock Island also has successful "Perc Tests" for an additional 15 bedrooms; engineers certified letter on hand (This could be for accessory uses; IE guesthouse, caretaker cottage, etc.) Vehicle access up to Great Rock is at its east elevation by a deeded, land court right-of-way from Glades Road. And neither Island is subject to any FEMA special flood hazard zones. With total privacy, pristine natural beauty and unmatched vistas from high elevations, these dramatic harborside islands create the ultimate seaside living experience. 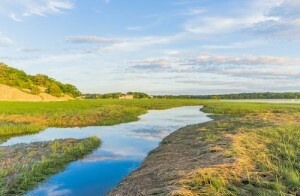 While the islands are nestled and protected inland off Glades Road and its corresponding seawall in 'Scituate Neck', they do offer towering 360' views over the Atlantic Ocean, Glades Road and Minot Beach to the east, Hatherly Country Club, Wood Island, Bassing Beach and Briggs Harbor to the south and southwest, Bryant Point, Whitehead, Cohasset Harbor and Cohasset Cove to the west, and the Atlantic Ocean and Historic Strawberry Point to the north. On clear days, northern lines-of-sight extend over Hull, Boston and all the way to the North Shore coasts of Salem and Marblehead. Twilight views from both islands are beyond spectacular, experiencing remarkable sunsets over both land and water--not commonly found on the east coast. 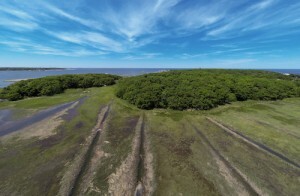 The islands boast multiple types of soils (a combination comprised of upland soils, beach/dune deposits, and salt marsh) and an abundance of natural life / diverse ecosystems along the ever-changing shoreline. 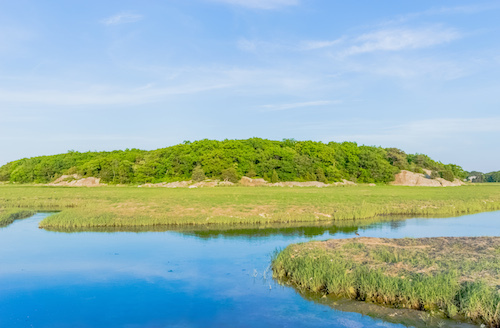 Wade through tide pools to explore, paddle along the rocky coastline and see Laughing Gulls, Black-Backed Gulls, Gannets, Terns, Herring Gulls and Cormorants wheeling overhead and dipping into the water. During some winter months, you may even spot a Harbor Seal using the rocky coastline as a location to mate and rest. 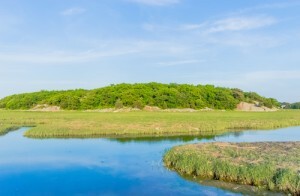 With such a considerable area of undeveloped acreage offering dramatic and rare geological land formations, unmatched vistas from high elevations, seaside wildlife abounds and a private island address in one of the South Shore's most dynamic locations - these islands offer a connection to a pristine natural environment like none other. Great Rock and Little Rock Islands are indeed unique and together, they would offer the ultimate seaside living experience. Nowhere else is there such a combination of splendid privacy accompanied by such immediate proximity to New England's greatest hub of activity. This is the setting for families to enjoy the unforgettable memories of vacations; or year-round living in their own piece of paradise by the sea. 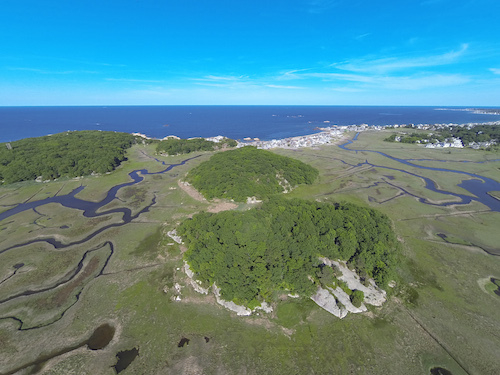 Great Rock and Little Rock Islands are the symbol of coastal New England's enviable lifestyle.